It wouldn't be Christmas if I didn't mash up some barely recognisable pictures into a big ole mess and challenge you to identify as many as you could... so here you go! Usual rules apply: send me an email (don't put your answers in the comments- it pretty much ensures that everyone else has a starter-for-ten!) to my first name dot walker at gmail dot com - and if you can't work out my first name, there's a pretty solid clue in the blog's name! Send me a list of puzzle names and designers (bonus points if you tell me who made the puzzle in question - in case we need a tie-breaker!). Entries close at the end of 2016... my time. The winner is the puzzlist who gets most right and they will receive something puzzling (of my choice) in the post. 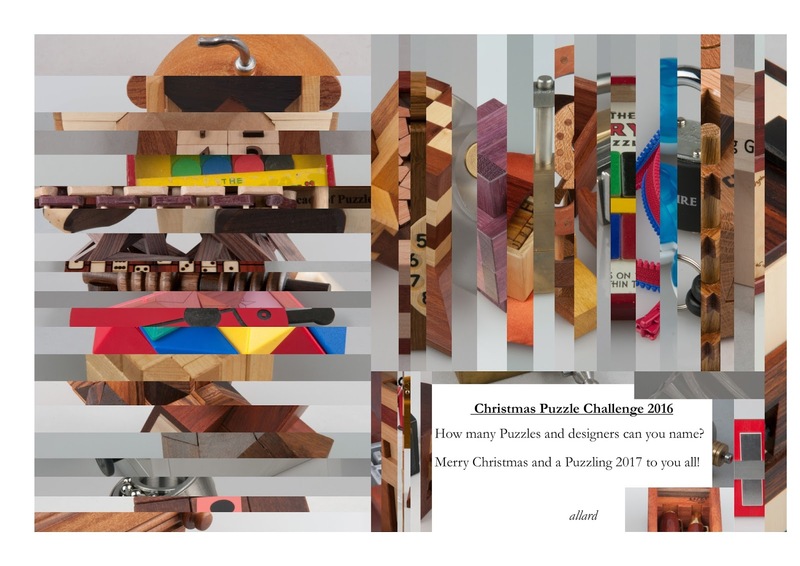 ...and have a very Merry Christmas and a wonderfully puzzling 2017! 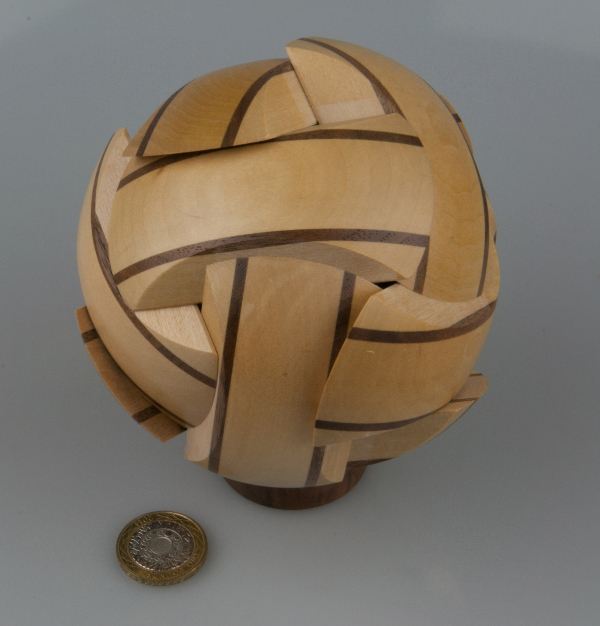 I’m ashamed to say that I didn’t spend much time playing with this puzzle in the Design Competition room at IPP36… there were so many other attractive puzzles and I don’t have the skills of a Pletcher who can literally work through solving every single puzzle in the Design Competition in the time available. I idly fiddle around with it whenever I’m at the PC in the study over the next few days, with virtually no progress at all. 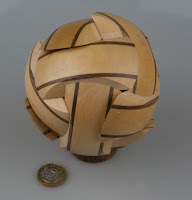 A little more perseverance and I figure out a rather elegant solution and it is a pure little piece of delight! And of course, if you step back and Think© about things a little, it’s entirely sensible! Super little “A-Ha!” moment beautifully executed by Tom… with this puzzle the maker’s art is almost as important as the designer’s! 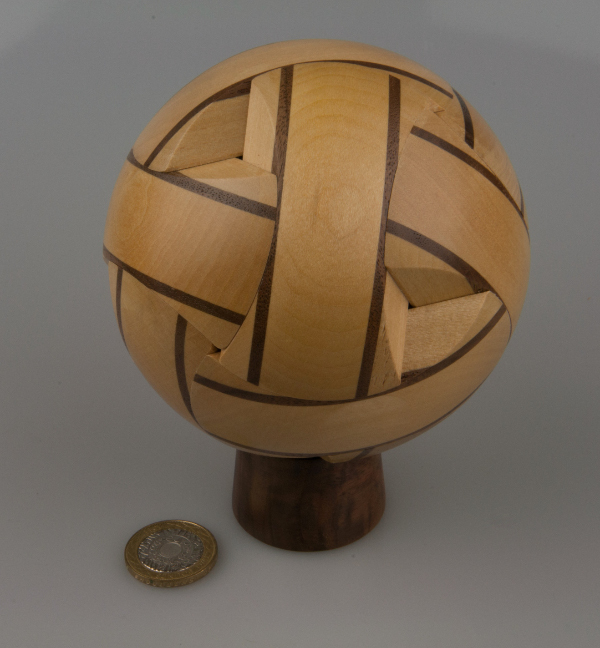 Heartily recommended to all puzzlers – find a copy and play with it – you’ll enjoy it! 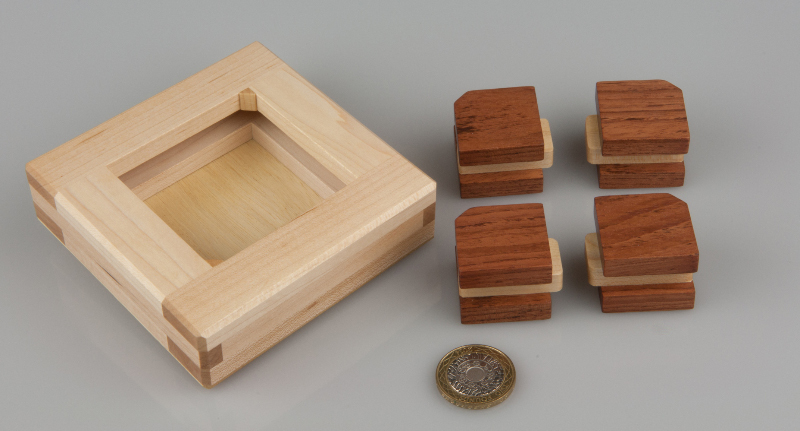 I’ve had a slowly growing pile of dovetail puzzles on my shelf-of-things-to-be-blogged-about for a little while now and the time has come to rectify that! 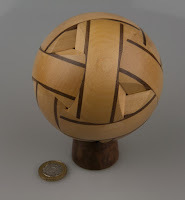 So here you go – a bonus-length blog post featuring 4 fantastic puzzles! 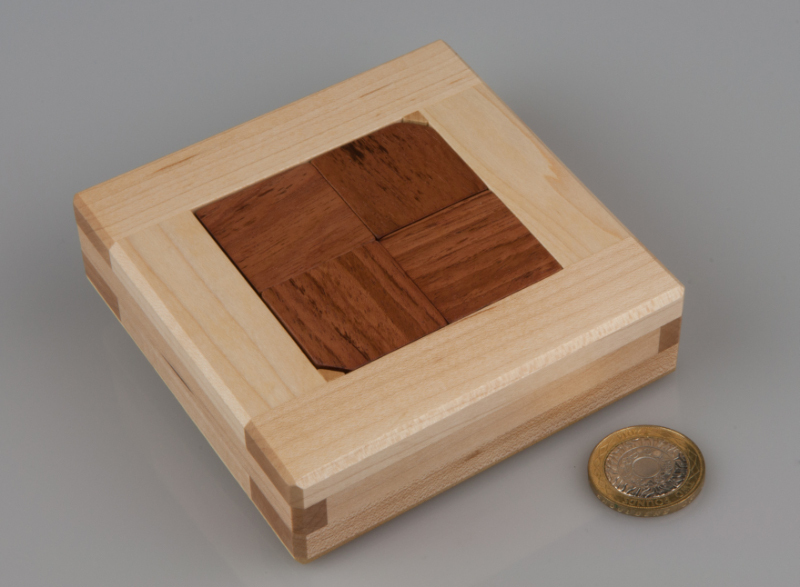 The Sandfield Joint was, I suspect, the first of the genre – crafted by Perry McDaniel, it was Norman Sandfield’s exchange puzzle at IPP14 in Seattle. 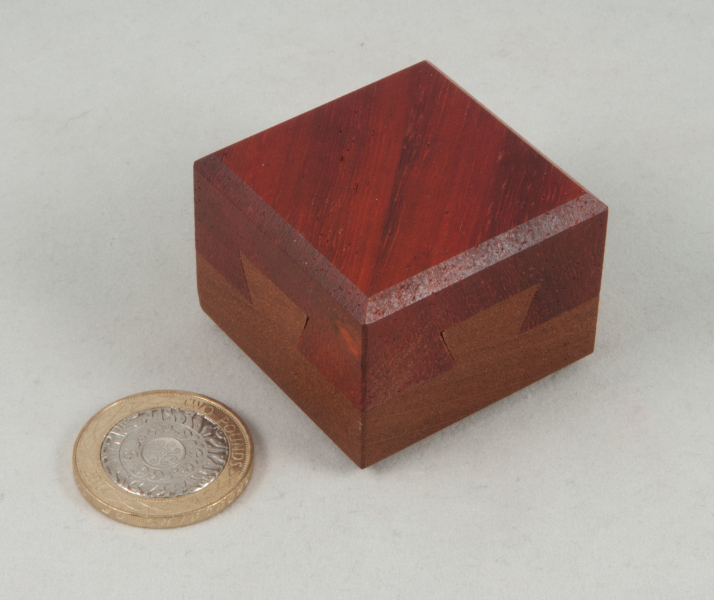 It consisted of a pair of wooden blocks (Mahogany and Padauk) apparently joined by a pair of intersecting dovetail joints – the first classic impossible dovetail? It’s not a super-tricky puzzle, particularly if you’ve already seen the impossible dovetail idea before, but the locking mechanism might take you a little while to figure out. 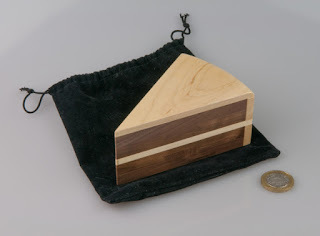 Probably the simplest and most honest of the various dovetail puzzles out there… another reason why I’m inclined to believe it was the beginning of the genre... a good introduction to the series, one to give you a false sense of accomplishment! 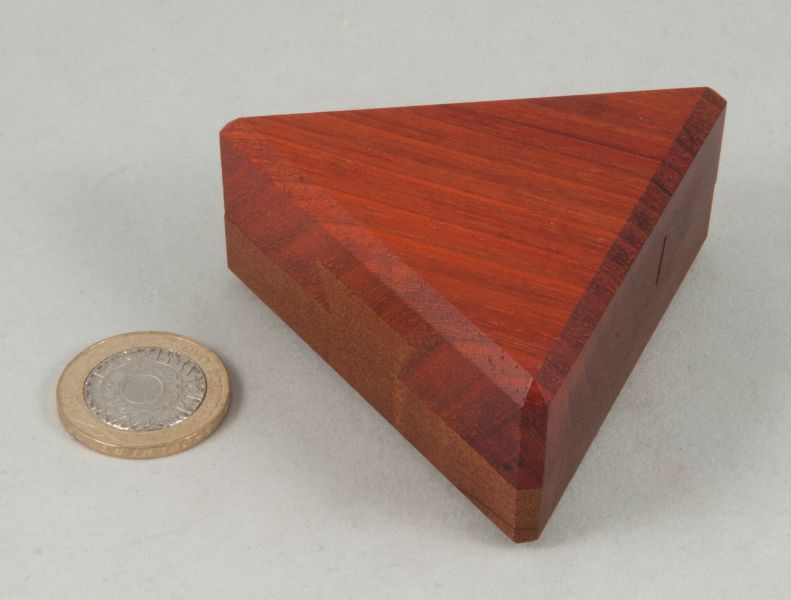 At the next year’s IPP in Tokyo, Robert Sandfield exchanged his Dovetail and a Half – a triangle where each side of the triangle has a dovetail joint on it… so clearly one half of a dovetail must be missing somewhere, inside? 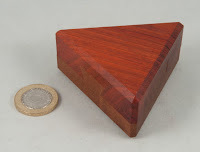 Perry McDaniel was on puzzle-crafting-duty once again and the same woods (Mahogany and Padauk) make up the opposing halves of this puzzle. 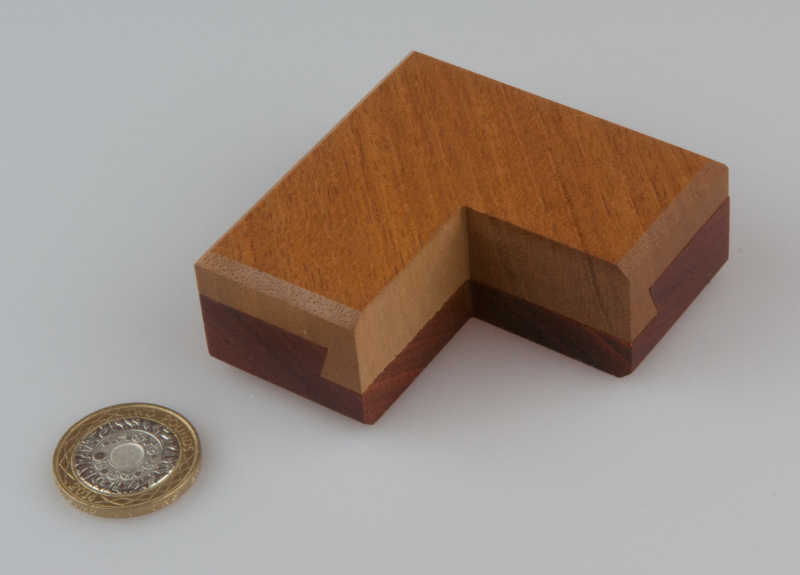 Whereas the Sandfield Joint may be a reasonably straightforward puzzle, Dovetail and a Half is not! My copy came from a friend and I struggled for quite a while to separate the two halves… failing miserably. When a puzzling mate came around to collect some puzzles, I gave it to him to demonstrate for me quickly, and he failed to open it as well… at the next MPP I gave it to the solver-of-all-puzzles not expecting it to remain locked together for more than a few seconds in his dextrous hands… but it would not yield to him either… had I bought a copy that had somehow become locked up? I began to have some doubts, so I did the only sensible thing and bought a second copy – one that came with a copy of the solution… which was a bit different to what we’d all assumed the solution was – and that extra step or two had totally baffled every single one of us – of course if you do the right thing on my supposedly impossibly-locked-up copy, it opens up perfectly… Perry’s tolerances remain perfect fifteen years on – it’s just the stupid puzzler who thinks he knows what he’s doing that can’t open the thing! 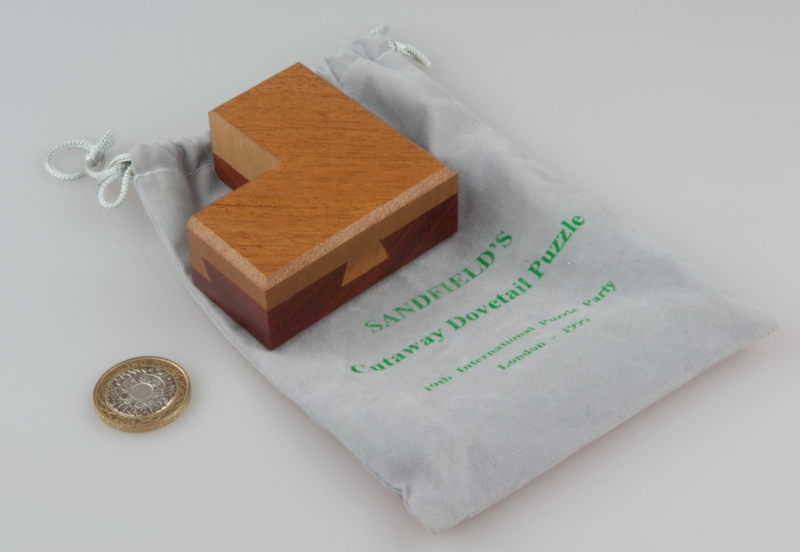 Next up is Sandfield’s Cutaway Dovetail Puzzle – Robert’s 1999 exchange puzzle. From the pictures you should be able to tell that it’s form Perry McDaniel and once again uses the same woods – nice little bit of continuity in there? 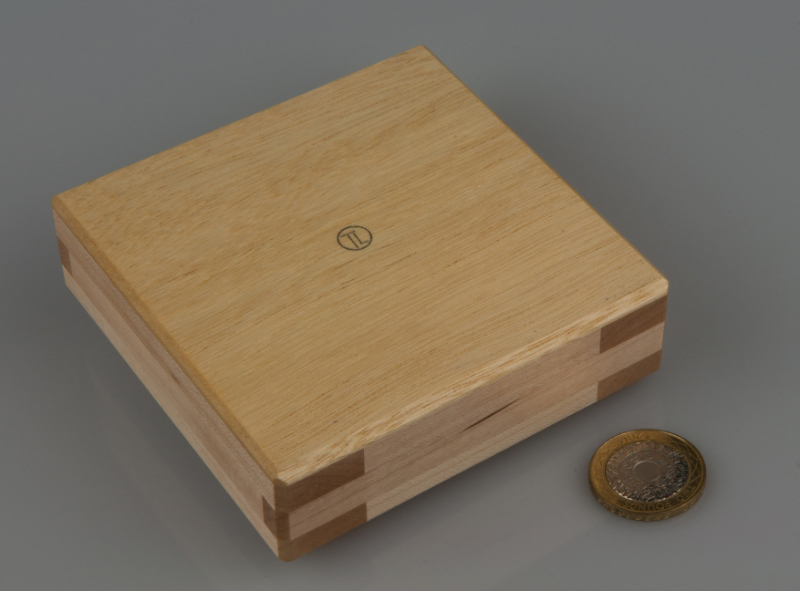 If you look carefully at the sides, you can make out a couple of dovetails which should give you a clue as to how things might come apart, but this chap has a few nasty surprises for puzzlers – there are a few distinct phases to getting into the final secret compartment to discover the hidden cherry surprise (cute touch!) 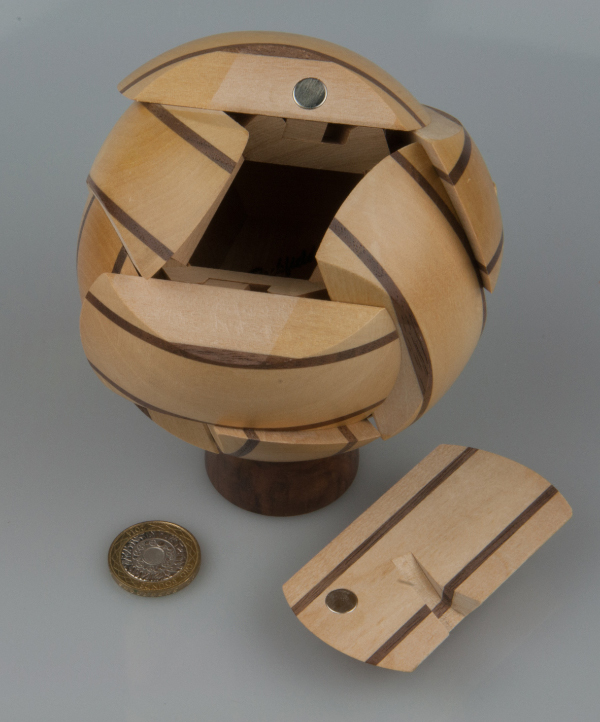 – but not only that, there are some rather unusual discoveries long the way – and there’s definitely a sequential discovery aspect to it all as well… a lot of the old tricks, and some news ones are used in there – it’s not just beautiful, it is a seriously testing puzzle! The next time I ran into one was at my favourite puzzle shop in Hakone, after the crowds had left, when the proprietor emerged form the back room fiddling with a copy… and in answer to my pleading looks, “Sorry, not for sale!” unfortunately. Dream of Zebra won an Honourable Mention for Iwahara in the 2001 IPP21 Puzzle Design Competition… it’s been around for a while. Yet, if you look back through the historic records of the puzzles auction sites you’ll only see a few of them changing hands, most seem to have remained in the grateful hands of their current owners… and there’s a good reason for that… so when I was offered one recently, I handed over a small pile of cash, swiftly. Back at home a couple of days later I finally got to enjoy it properly… it’s not that challenging as a puzzle – there is a fixed set of moves to be made, with no blind alleys or detours along the way… follow the path and the final panel can be removed, revealing the maker’s mark inside (the anglicised “Rockfield” in this case). Not just a beautiful object, one that required considerably more skill than usual to create in the first place – respect, Hiroshi Iwahara.